We managed to fit a whole bunch of stuff into the first week of summer break!! We packed up all the leftover notebook paper and locker shelving, had the first summer piano lesson, made homemade ice cream, spent an hour at a cat cafe downtown, swam in our neighborhood pool, stayed up late to watch a movie, ate snow cones, shopped for clothes and sunscreen for camp, visited friends, and stocked up on books from the library. Now you know why there was no blog post earlier this week! I attended high school graduation at our daughters’ school on June 1st. My prayer that night was that God would bless the coming 12 months, the next 364 days (my daughter and friends already started a countdown : ) until our oldest graduates from high school. I’m a realist. I know that every moment won’t be sweet. There will likely be just as many – and probably more! – ups and downs as there were during her junior year. But, as much as possible, I want to savor the days. Life already looks so much different than it did just a few short years ago. Our girls chose to bring their band instruments home from school for the summer. Which means that if you walk into our house right this minute, you’ll see two saxophone cases lined up by the wall in our living area. And there’s the music stand I just ordered them from Amazon. Along with a wicker basket full of music books and sheet music. As I walked past this unplanned music corner, I realized that we show our families what’s important to us by the space we give things in our homes. While looking around, I thought of three things I hope we’ve provided – and continue to provide – for our daughters. We also get to enjoy live music in our house. Both girls play the piano and saxophone, and one of them brought home a flute for the summer (because why not add another instrument???) Going to concerts, musicals, or band concerts can also be a fun family outing. I’m not here to define what “good” music is for you. I know that just within our family, we like different styles of music. With any kind of entertainment, I try to consider Philippians 4:8. We are a family who loves to read! It’s been a constant struggle to find age-appropriate books for our girls through the years since they go through books so fast! Just like when I was a girl, fiction is their favorite, and I always want them to embrace the joy of getting lost in a good story. However, we make sure to include non-fiction in their assigned summer reading so that they can cultivate a taste for that as well. Here are some of the books our daughters (ages 17 and 15) are reading this summer. Taking the time to sit down and talk with each other is a great way to stay connected. Many of our family’s conversations revolve around mealtimes. Sunday lunch, which we usually eat out at a restaurant, is a prime time for catching up on life or talking about plans for the week ahead. We try to eat supper together as many weeknights as possible – though it doesn’t happen as often with both daughters involved in extracurricular activities, and one of them working a job as well. Conversation topics range from what happened during the day to news or sports (my older daughter’s currently interested in the NBA playoffs) or what I heard on a recent podcast. When our daughter comes in from work at night, we try to be available to hear about her day. Occasionally I plan “mom-and daughter” conversations, and grab a few minutes with my girls to discuss a particular topic. I’ve found it much better to make those talks as informal as possible! Whether your summer’s off to a slow or a fast start, I hope you’ve had a great week! 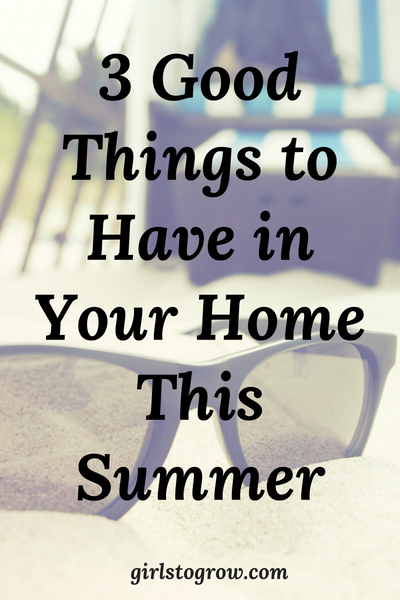 Let me know what good things you’re keeping around your house this summer. You started your summer off with a bang! What a fun week! Thanks for the reminder about the music; I forget to turn it on, too. That’s an interesting thought, that we show what’s important to us by what we have lying around our houses. Very true! I also still have an old copy of Passion and Purity that I read as a late teen/young adult! I was going to have my teen girls read it anyway, and then my 15-year-old’s Bible teacher gave all of her students a copy of the book on the last day of school. I think that motivated my daughter to be even more motivated to read it.